Over the past few weeks, UFCW Local 8GS has been coordinating a disaster relief fund for members of our union family who were affected by the Camp Fire disaster in Paradise, California. Close to 200 members of UFCW Local 8GS, including retirees, were displaced or lost their homes to the fire and have not yet been allowed back into the area. 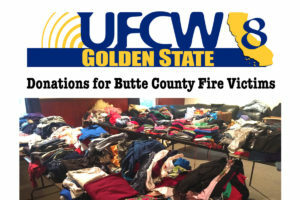 UFCW Local 8GS is working with local unions, employers and other community groups to help get members the resources they need, including food and clothing, which is being collected at CWA’s Union Hall at 1009 Sycamore Street in Chico. “Our union is passionately committed to the principle of ‘an injury to one is an injury to all.’ We exist to help our members endure and thrive when tragedy strikes, as well as when times are good,” said UFCW 8GS President Jacques Loveall. Please donate here and help our members during this challenging time. Members in the region who have been affected by the fire can get information about state and local disaster and relief efforts here or by calling 888-834-4488.